signaling SANDAG’s demise from incompetence or corruption? Oh, city of lights shall I compare thee to the city of lies? Thou art more lovely and urbane. And all by transit are steps away. That it can throw GHG reduction under the car. So can the ugly live and be balanced with thee! This conversation about politics, mitigation, habitat protection and development did not start at the Voice or by Developers. Truth is, it started a long time ago and has been here all along. It was first recorded by Plato in the “Republic” in the debate between Socrates and Thrasymachus who claimed he was the pragmatist and Socrates but a dreamer. Thrasymachus, the realist, moved with the power people and got things done while Socrates, babbling like a child about truth and justice, could never hold the levers of real power which alone enables one to be effective. It is called Realpolitik today. And truth is, this conversation will be with us as long as man inhabits earth. Question is will we bring it out in open or let it stay hidden behind Developer facades? We are indebted to the Voice for bringing out in the open what we in San Diego refuse to talk about. What we refuse to see and talk about is the contest between power and justice over property rights, city building, farm and wilderness preservation, resource use, transit, and climate change. This unspoken conversation lurks behind every city project that doesn’t have transit; behind every rural project that is served by freeways; behind every freeway enhancement project; behind every fake bike and walk project; behind all managed lane projects; behind a parking garage instead of transit to airport; behind the fact we can’t double track the coaster in 50 years. The so called realists (SD planners) claim that you cannot challenge or change POWER; ALL you can do is mitigate its harmful effects by dealing with symptoms. Thus, in the current great debate over habitat destruction we, in San Diego, never deal with the cause - the disease of bad city building called sprawl; rather we mitigate symptoms of this land use disease by buying habitat. Problem is, the cause remains untouched and the question then remains: does buying replacement habitat actually equal land lost? And if you don’t deal with the cause won’t things keep getting worse? And do you really save land by buying it? The assumption behind answering yes to all these questions is acceptance of the fact that POWER dominates politics, unchecked development is unstoppable and all land is already lost in San Diego. While there is some truth in the above assumption, the fact is these are NOT ENVIRONMENTAL questions; nor is arguing over the value of habitat acquisition an ENVIRONMENTAL debate. These are development questions and development debates; we refuse to deal with the real question of urban growth boundaries and good city building. Instead we quibble over degree of MITIGATION. I submit again that arguing over mitigation means you’ve already joined Thrasymachus in the power vs. justice debate. The environmental threat to the San Diego’s forest was settled by a DEVELOPMENT plan that limited development to country towns. It worked; no mitigation; no habitat acquisition; no problems. It worked. It works in Portland, too. They do not have this fake-environmental-saving-the-land debate in Oregon because they have a DEVELOPMENT SOLUTION CALLED URBAN GROWTH BOUNDARIES (see page 32) and they’re on track to meet the 2050 80% GHG reduction goal! How about we use the Portland model and return to the development debate? Read The Growth Ponzi Scheme here, via Strong Towns. 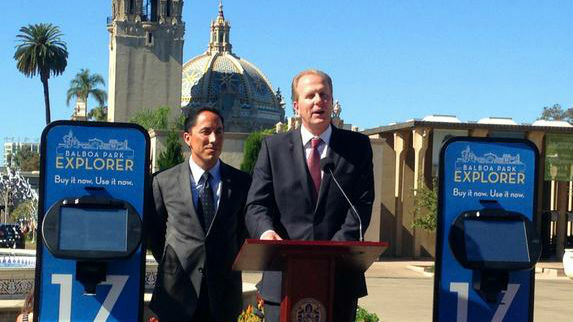 We are calling on the City of San Diego leaders to stand up for climate change and stand up for their Climate Action Plan, specifically Councilmember Todd Gloria and Mayor Faulconer. You have a large weighted vote here at SANDAG and you can use this vote to postpone or reject this freeway first, climate killing RTP- until you have a transit first alternative in San Diego which allows you to achieve the CAP. This is very possible. SANDAG’s own authoritative study the Urban Area Transit Strategy, which is an appendix to the RTP proves that the CAP is possible and achievable. You can model transit first in San Diego, but SANDAG has failed to do so. We are tired of the stale excuses- not one of them is accurate! The plan is not balanced- it increases GHG and VMT in the face of statewide climate policy calling for reductions, it relies on freeways and keeps us locked into our cars, it fails to provide effective transit, bike and walk options for the future leaving us with the same pathetic 3% transit mode share we have now for the year 2050! That is not a plan forward- that is a plan backward!! SANDAG- you can do better and you must do better! This is why we call upon Gloria and Faulconer to stand up to this RTP, to demand better for the city of San Diego and vote no, until a transit first option can be implemented which will allow you to achieve your CAP that you’ve touted all over San Diego and even in Sacramento! Enough with the tired excuse that you will lose federal funding if you don’t approve the RTP in time- well guess what- you have time, we ask that you delay- at least 1 month, and we know that Gary and his planners will be able to deliver alternatives that meet the CAP if the future of the RTP approval is at stake! Allow them to rise to the challenge instead of folding to the powers that demand you approve this fraud of a transportation plan! Leaders of San Diego- summon your political courage and be the climate activist you have claimed to be! Actions speak louder than words and it is time to prove you are not a climate coward by voting no or postponing the approval of the RTP until it meets the CAP! Prove you are leaders whose word means something; prove you are leaders we can be proud of!! Stakeholder or Citizen; Collaborator or Resister? In this story about forest protection -http://www.eastcountymagazine.org/fighting-forest-descanso-resident-duncan-mcfetridge#comment-30401- a commenter was puzzled about my silence on what he deemed was the greatest threat to the San Diego backcountry: mega-renewable energy projects. The commenter was wrong on two counts: 1) Wrong that renewable energy is “the greatest threat that the area faces” and 2) wrong that CNFF and Sofar have been silent about the wind energy debacle. Allow me to explain. Any activist group that truthfully takes up good city building and environmental protection in San Diego, the endangered species capital of North America, and tries to scale the Mordorian cliffs of political desolation that tower over the region will be faced each day with a Sisyphean task (http://en.wikipedia.org/wiki/Sisyphus) of unending labor with the Promethean (http://en.wikipedia.org/wiki/Prometheus) result of having your guts eternally ripped out. Why do it? Why not save your guts, collaborate, get a little mitigation and go along with the “authorities”; in other words, why not sit on a fence and be silent? Truth is that in San Diego we live in the equivalent of occupied territory in which public agencies are steeped in complacency or corruption and where politicians are owned by the special interests dominated by the development industry. It is those very same interests that control the resources that are needed by the sprawl growth industry to spread their tentacles over the land: The energy, the roads, the water, the land and most importantly the propaganda media machine that in a real community should be regarded as public resources to be conserved and distributed in accordance with the public good are instead treated as commodities to be bought and sold in the market place. In San Diego we have the politics of a marketplace not a community. The land of happy talk and sprawl. Every excuse, every shrill denial, every exaggeration about our lawsuit by our so-called leaders misses the whole point of the CEQA impacts discovery process. The Cleveland National Forest Foundation (CNFF) sent a formal request to the California Coastal Commission to postpone project approval for the North Coast Corridor Public Works Plan/Transportation and Resource Enhancement Program (PWP/TREP). This project would expand and widen areas of Interstate 5 between La Jolla and Oceanside. The program EIR governing this project, SANDAG’s EIR for the 2050 Regional Transportation Plan (RTP), was invalidated by the Superior Court for failing to analyze compliance with Governor Schwarzenegger’s Executive Order EO-03-05 regarding State reduction targets for greenhouse (GHG) emissions. SANDAG’s 2050 plan which, if properly analyzed, would have revealed to the public a 700% increase in emissions when compared to the reduction targets set by EO-03-05. SANDAG also failed to evaluate mitigation measures to avoid those impacts. Missing also in the 2050 RTP program EIR was an evaluation of the serious regional health impacts due to vehicle air pollution. Nowhere is a correction of program level failures or completion of promised impacts studies. Instead, the project EIR for the I-5 widening repeats those very same program level failures by not properly evaluating the massive increase in GHG, by not analyzing the health impacts of increased vehicular travel, by not properly analyzing the need for the project and by not providing an alternative to avoid these impacts. McFetridge pointed out that the California Coastal Commission has, as its expressed duty, to protect the coastline of the State of California. McFetridge said that not one agency has taken the time to study the threat to public health that will accompany an expanded I-5 freeway. Help the Forest: Email Comments to Supervisors and Attend the Meeting Wednesday! It’s rare that we reach out to you two weeks in a row, but we need your help to protect the Cleveland National Forest! The County Board of Supervisors will meet THIS Wednesday, June 25, to set guidelines which will determine the fate of the forest. Last week, we contacted you with information about the Forest Conservation Initiative (FC), which was overwhelmingly approved by voters in 1992 to establish 20 uninterrupted years of forest protection. It was widely supported by the public, local governments, and high profile individuals, and has fulfilled its purpose of protecting the health and stability of the forest. However, the San Diego County Board of Supervisors will meet THIS Wednesday, June 25, 9:00 a.m., at the County Administration Center, 1600 Pacific Highway, Room 310, San Diego, CA to consider plans to replace these longstanding protections, and we need your help. The FCI is the first item for discussion. Click HERE for a PDF of the agenda and HERE for the Staff Report. The Cleveland National Forest Foundation has strongly urged the San Diego County Planning Commission, and now the Board of Supervisors, to consider the environmental and legal concerns of removing FCI protections. There is an excellent piece posted at Voice of San Diego today by renowned climate change expert Dr. Michael Soulé, also urging the County to re-adopt the FCI. Please share this piece and the opportunity to help with your friends! If you would like to help, please plan to come speak at Wednesday’s meeting! Letters of support for the Forest Conservation Initiative can also be sent via email to the Supervisors and Board Clerk. San Diego proudly protected its forest by a resounding vote of the people when it passed the Forest Conservation Initiative in 1992. Land within the Cleveland National Forest should remain protected. Since the FCI was adopted, the San Diego region has experienced the impacts of devastating wildfires, and we are only now beginning to understand the impacts of climate change to our local water supply and fire conditions. If the forest is not protected by a re-adoption of the protections as they were implemented by the Forest Conservation Initiative, San Diego’s growing population WILL sprawl into newly developed lands within the forest boundary. The increased fire danger, diminishing water supply, and impacts to habitat will endanger human life and wildlife. This is unacceptable. I urge you to direct staff to include all the protections initially embodied in the Forest Conservation Initiative at your June 25 meeting by including the standards set by the FCI in the EIR for the General Plan Amendment. Please send your emails as soon as possible for consideration by the Board, and feel free to copy me on your comments at sofar@nethere.com for CNFF’s records. Feel free to email this to friends. You can also share this link via email, Twitter, or Facebook.